I gotta give it you guys. You have been patient, and I appreciate it, and now your taste buds will appreciate it even more. Last week, while I was working on the summer freezer prep, in the background, my slow cooker, was just doing its thing. As soon as I got home, before I even started preparing the other items, I grabbed the slow cooker, an onion, some peeled garlic cloves, and one half of the pork shoulder I picked up. After five hours, on the high setting this gloriousness was in my kitchen. Friends – I wish for smell-o-vision for all of you. But as that doesn’t exist, you are just gonna have to make this, and see for yourselves. The slow cooker that I use has a cast iron insert. Once the pork finished cooking, I lifted the insert out and let it cook for an hour before I dug in with two forks. This method makes pulling the pork a synch. In a matter of two minutes, I had it all shredded. Sunday night, I put two bags into the fridge, and Monday morning, they were still frozen solid. So, I put them in the sink and let them defrost for several hours, and returned them to the fridge until I was ready to reheat. In a medium sized pot, on the medium high heat, I reheated the pork. Stirring occasionally. When I shredded the pork, originally, I removed very little of the fat cap knowing I would be freezing and reheating the pork. This made the reheat simple, and the pork much more flavorful. Now, what to do with all that pulled pork? Make sauce, of course. Not only was making this recipe simple, (minus my inability to make a decent homemade coleslaw), it was easily transported in the cooler to the pool. 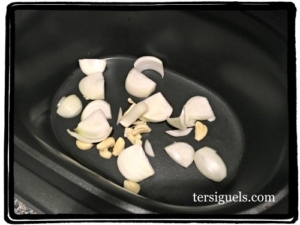 In the bottom of the slow cooker, put the onion and garlic. Place the pork shoulder with the fat cap on the top, season liberally with salt and pepper. Add one cup of chicken stock. Cover. Cook on high for 5 hours. Let cool for one hour, using two forks shred the pork. Server immediately, or divide portions, and freeze. Combine all the ingredients and whisk together. Chill for several hours, even over night before using. Store in an airtight container for up to two months. Spoon over pulled pork.